The Speckled Kingsnake is sometimes called the “salt and pepper” snake due to its unique, freckled markings. 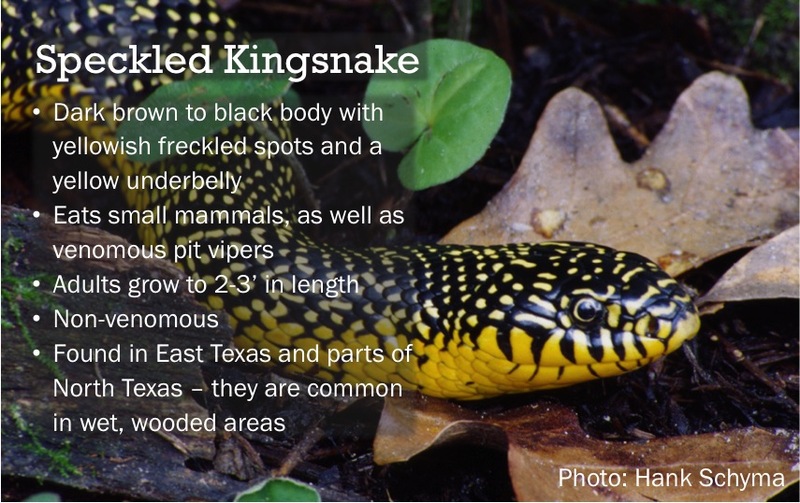 In Texas, these snakes range from the majority of the Eastern region of the state up into the panhandle. This snake is widely respected by those familiar with it — it is a great snake to have around your property! Speckled Kingsnakes keep down the populations of small rodents and venomous snakes. Look for these snakes in areas with damp tree stumps and logs, the Speckled Kingsnake’s favorite hiding places.